Celebrate the holiday at Janesville's 24th annual Labor Fest! Labor Fest will be held on Sunday, August 31st. Starting at 7am there will be a DJ, followed by Rev 21 from 12-3pm, Counterplan from 3:30-6:30pm and Killer Cars from 7:30-11:30 pm. Events include mud volleyball tournament and loads of live music. On Monday, car enthusiasts can experience the Labor Fest Car Show, which starts at 10am at 510 West Centerway, also known as Dee’s Barbershop. The car display will take place until 3:00pm. The final event in the Labor Fest experience will be the annual parade, which starts at 1:00 pm on Monday, September 1 at Academy Street and Milwaukee Street and ends along Main Street near Racine. BEGINS AT 1:00PM with the singing of the national anthem. Here's the story as brief as I can tell it. A Janesville resident, Billy McCoy, started a petition drive to have two questions (separate petitions) for the city council to take action on OR alternately have placed on the November ballot in the form of binding referenda for city voters to decide. The petition's legal foundation is supported by Wisconsin State Statute 9.20 on Direct Legislation. The first petition asks the city council to overturn a previous council decision and stop (or delay) construction of a new $9M central fire station. Construction has not yet begun. Typical of the subject matter, there are differing legal opinions as to whether direct legislation can overturn current legislation. However, there is precedent for direct legislation to effectively change the course of a building proposal prior to the start of construction. A proposed ordinance, initiated by a group of citizens, to require a village to hold a binding referendum prior to the start of construction on any new village building project requiring a capital expenditure of $1 million or more was an appropriate subject of direct legislation. Mount Horeb Community Alert v. Village Board of Mt. Horeb, 2003 WI 100, 263 Wis. 2d 544, 665 N.W.2d 229, 01-2217. The second petition would require the city to hold a public binding referendum for capital projects exceeding $2 million in cost. McCoy did all the necessary leg work, dotted the i's and crossed all the t's to win more than 3,500 signatures in fulfilling the requirements of the petitions to have its day in front of the council. On Monday, the Janesville city council had several options at their disposal to handle his petitions. They could choose to adopt one or the other referendum. Adopt both referenda. Refer one or both referenda to the voters for a ballot on an upcoming election. OR take no action. Unfortunately, they chose to take no action on either petition. In short, they basically ignored both petitions as if they did not exist. In addition, they offered no solutions or alternatives to the questions being presented by the petitions. Even though in my opinion, their decision to do nothing with the petitions was completely expected, I couldn't get over some of the arrogance and scold-like advisories a couple of the council members delivered in defence of their position. Their main theme was, "if you don't like the way things are going, run for office yourself and make the changes you want." And, "We're not a democracy. The people elected us to make the hard decisions." Believe it or not, those remarks came shortly after the council found some democracy for themselves when they approved their own referendum for November, asking voters to tax hike themselves $1.2 million a year for ten years to replace lost state aid revenue for local road repair. In complete contradiction to their reasoning opposing the petitions, the council ran away from the decision to raise the city's wheel tax for road repairs and instead passed off that decision to the voters to bury the fee under property tax bills. So much for hard decisions. In a bizarre moment, council member Doug Marklein recited a few lines from Howard Beale's depressing rant from the movie, Network. He then stated that not much has changed over the years since. Later on in the discussion, Marklein tells the petitioners that they should shift their anger towards Madison. Sadly, the Janesville city council epitomize everything that is wrong in government today. Disconnected, condescending, polarizing, negative and hostile to the wishes of the regular folks on Main Street, there’s little more I can say to describe their general attitude last night without getting heated. On the other hand, the leader of the petitions, Billy McCoy, issued zero threats, zero ultimatums. He was respectful but direct in asking the council to take action at the request of 3,500-plus residents who signed each petition. They not only refused, ...they snubbed their noses at them. One of the more amazing aspects of McCoy’s petition drive was that he succeeded with almost zero Internet or social media presence. He does not blog, Facebook or Twitter and although only a few of the petition signers showed up to speak at this council meeting, the petitions and McCoy’s solid performance speaks for itself. It should also be noted that the Janesville Gazette marginalized McCoy's messaging and editorialized in opposition to both petitions. But to be ignored is a serious loss for the signers of the petitions and I'm also not certain if these petitions automatically go to referendum in November. You can expect updates from me on that situation and more on the city's road tax hike referendum. All I can say at this juncture to the folks who signed those petitions: Don't get mad ...GET ORGANIZED! NOTE: You can view key remarks from several council members on this subject here. It begins at the 3:36:00 mark and runs up to 3:56:00. . Tired of elected officials playing party politics during a national crisis? Tired of politicians creating a crisis where there is none just to play politics? Tired of party politics altogether? Well then. You might not want to read what Rep. Paul Ryan had to say on CBS' "Face the Nation" Sunday. Apparently, he would rather let the country slip into total chaos so long as his precious conservative party remains comfortably intact. SCHIEFFER: Let me ask you about a couple of things in your book. I want to read a quote that has picked up a lot of attention. It takes us back to last October, when the Republicans shut down the government in an attempt to defund Obamacare. You didn’t say much at the time about the Ted Cruz strategy, that is, rallying key party conservatives on the House side to let the government shut down, but here is what you wrote in your book. “In short, the strategy our colleagues have been promoting was flawed from beginning to end. It was a suicide mission, but a lot of members were more afraid of what would happen if they didn’t jump off the cliff.” I guess I would ask you first, why didn’t you say that back then? Bingo! I call Bingo! Bingo! Bingo! Seriously. Ryan said he failed to rebuke ...what he saw back then as a suicide mission of his party's own making because. he wants. party. unity. Does that make sense to you? Not me. He is not fit to be our congressman, yet he wants to be president. Striving For The Center, The Inclusive Paul Ryan Trashes Everyone On The Way. If you're from the Janesville area, you may have noticed that the Janesville Gazette posted several articles in the past week on Rep. Paul Ryan, including a front page headliner. To win such a high profile in the local news, one might think that since Ryan is afterall our congressman, the articles would be about his signature achievements in Congress, or his district accomplishments or proposals to restore trust in government, or how to take moneyed influence out of government. To be fair, producing those stories would be asking the impossible. Instead, the articles promote Paul Ryan. Period. Well, that and his ghost-written book, "Paul Ryan, The Way Forward." I of course don't intend on buying the book, but from everything I could gather after reading several reviews, the book is loaded with personal denials, philosophical reversals and misguided party politics, and is meant to reshape his image as a centrist by default, setting the stage for an apparent comeback in 2016. We know from the past that Ryan has repeatedly demonized the Left, Liberals, Progressivism and Liberal Progressivism. He has gone as far as calling progressivism a "cancer." He doesn't like us. We get that. But pretty low stuff from someone now claiming his party or "movement" needs to shoot for more inclusivity. This is where Ryan, at least by the message I gathered from the reviews, now attacks the Right and Conservatism. He's taking sort of a newspaper editor's view to achieve centerism or political balance. It works like this: if both sides attack me, I must be doing something right. Except, the main difference between Ryan and the typical newspaper editor is, the editor is working within a business model (not all, a growing number are working a political model) to gain customers - to unify and prosper. Ryan on the other hand, is working in a political model - to divide and conquer. You do that by trashing everyone, even if it means being called a betrayer by your own base. In fact, I believe Ryan sees that internal derision as a sign of success for his book. It was a suicide mission. This can’t be the full measure of our party and our movement. If it is, we’re dead and the country is lost. If it was a suicide mission, Paul Ryan killed himself. He not only voted in favor of defaulting on U.S. government debt, but several observers noted that at a most crucial time during the standoff, when true leaders were needed to negotiate, he stood with the obstruction behind closed doors. Either way, the shutdown continued. And in the subsequent days, Ryan dug in. The Washington Post reported on Oct. 12 that in a closed-door meeting, he railed against a bipartisan Senate deal to reopen the government, "saying the House could not accept either a debt-limit bill or a government-funding measure that would delay the next fight until the new year." Conservatives who consider themselves "true" including the tea party nutters aiming to obstruct government, loved Paul Ryan for that. Although they may have had earlier doubts, they figured deep down, he's with them. But that key passage from his book now trashes everything they all stood for, and conservatives have noticed. Not only just that, but Ryan's book passage also implies, albeit indirectly, that if the White House and Senate had been controlled by Republicans during the shutdown standoff, that if they had single-party conservative rule undivided government, their suicide mission to default would have succeeded. The country would have been lost. Indirectly again, Ryan is admitting that indeed it was moderates and Democrats who saved the country. Conservatives get that too and now feel totally betrayed by Ryan and his book. After being rejected in the 2012 race for the White House, Ryan must focus on efforts to move to the center without compromising on policy or issues. As I see it, the congressman no longer needs to bother trashing the Left or Liberals. The damage is done and he's good with that. His only way to arrive at that center sweet spot for his political ambitions is through default - by forcing conservatives to push him there. Point is; you're not in the center until you're despised by both sides. It's more of that good ol' fashioned Paul Ryan inclusivity. AATP - Paul Ryan Lies Through His Tea-Stained Teeth about Government Shutdown HE CAUSED! Just when you thought Wisconsin republicans couldn't get any lower, they find a new tunnel to excavate under the gutter. According to this MKE Journal Sentinel story, Wisconsin Assembly Leader Robin Vos, decided it was time to shake down lobbyists so they can personally pay back politicians who have willingly sold out our legislative offices for client donations. For years, Madison pols have been asking lobbyists to hit up their clients and company execs for donations. But starting in June, Vos and the Assembly Republican leaders began calling in and contacting lobbyists one by one to say they were each on the hook for at least $500. Consider the fact that that story is from last year and how little press it received throughout Wisconsin. But now there's a new twist. Boss Vos and other assembly republicans also want lobbyists to take to the streets, start knocking on doors and pimp republicans to voters. Honest. Madison — Republican leaders in the Assembly are urging lobbyists to help them knock on voters' doors in an effort to strengthen their majority. They've dubbed the effort "Leggiepalooza." Rep. Jim Steineke (R-Kaukauna) this summer has regularly emailed supporters to tell them when and where to meet for the door-knocking program, and already some lobbyists representing key industries are participating. Strengthen their majority? They hold a solid gerrymander fortified 60 - 39 majority in the assembly. Is this what assembly leaders are focused on? Wouldn't LOLpalooza have been a more fitting name? But seriously, where is all this headed? Here in Janesville and Rock County, the local media including democrats went nuts on then-Rep. Mike Sheridan when they discovered he was merely dating a lobbyist. Some political observers believe voters continued to harbor those feelings against the former assembly leader, preventing him from winning the recent democratic primary for the state senate. Now we have this from state republicans? The additional problem with this new system of influence peddling is, we can no longer tell the difference between the pimp and the prostitute. Why isn't it getting much more attention in the press? From the "you can't make this stuff up" category comes Sunday's Janesville Gazette headline story about the I39/90 interstate expansion, "Is funding a roadblock?" The story, conveniently published almost two months after Democratic candidate for the 15th District State Senate, Austin Scieszinski, claimed the decision to approve the interstate expansion was done behind closed doors and resulted in a deal that washed up to $500 million away from local road repair and maintenance, confirms almost everything he said. That's the good part. The article did contain some truth and some facts, but not enough of them. The problem is the newspaper added up what they had, including a few sketchy comments from Sen. Tim Cullen, and then purposely painted the wrong conclusion for hardcopy readers by pointing fingers at the feds. The hardcopy contained the title, "Interstate/Fingers point at feds" on the page it was continued on. Yes, it was a state decision to expand the federal interstate and yes, state legislators making the decision knew it would result in a major shift of INNER state funding that could wash up to $500 million away from city and rural roads. It was that statement by Scieszinski during a candidate's forum, that raised the back hairs of his opponents. They attempted to marginalize the importance of the funding ratio, calling the ratio "immaterial." But to this day, no one has disputed his numbers or how they got there. The only difference now is understanding that the flipping of the funding ratio was the result, not the cause, of the funding shift. The funding ratio number is merely part of the transaction report. Still, the ratio provides an important aspect that helps put funding requirements and expectations into a clearer perspective. If it was 80/20 before and changed to 30/70, working backwards could find the culprit. But nobody wants to go there. The other thing is; every new highway project the state may want DOES NOT have to change the federal/state funding ratio of other highway projects - assuming the federal amount is static. Unfortunately, it's the state that appears unable to keep its end of the bargain and it is those little "nuances" that are worked out, usually behind closed doors between state legislators, bureaucrats and lobbyists, that determines which funding will be used for any given project, where it comes from, where it's going, and who will be the winners and the losers. You'll recall it was the I39/90 expansion's biggest lobby group, Forward Janesville, who criticized Mayor Tom Barrett for defending local road funding and as I suspected from the beginning, city and rural taxpayers across Wisconsin will be facing a wave of local wheel taxes and road tax hike referendums to restore the lost funding. It's not the federal government to blame. Obviously, we were the losers. As fundamental as this might sound, it still must be repeated. The state's blame game over funding this project is not over building or funding a new federal interstate highway, where there is none. Their funding blame game IS over expanding an existing interstate. The I39/90 expansion is NOT a federally mandated project. It is a Forward Janesville/State mandated project. Please keep that in mind. It's pure politics. So, the state has to put the spin cycle in reverse in order to shift the focus away from local lobby groups to place blame on everyone's favorite boogey man - the federal government. It's true the federal transportation fund is facing a shortfall of $58 billion, but that has nothing to do with the decision to expand the I39/90 interstate. I guarantee you Congress will find ways to keep the national highway fund replenished with new money. It's also likely Republicans will take the federal transportation fund hostage for a new ransom demand from Obama, but in no way will Rep. Paul Ryan allow the federal trough to run dry for a top local support syndicate like the Forward Janesville Rock Roads transportation lobby. Again, nobody has come forward to prove Scieszinski's major sticking points wrong. Nobody wants to explain exactly what effect did approving the I39/90 expansion have on funding local roads. As it turns out, he caught nothing but ridicule from opponents and the state road lobby. It's also important to note that Scieszinski supports the interstate expansion. If you're a steady reader here you probably know that I need to update some of my featured stories about local politics, the Janesville Gazette media conglomerate and local economic development. Although those subjects are intricately weaved together in Janesville and deserve book form, I'll try to stay on just one subject for the purpose of this post - The Janesville Gazette. To begin, people should understand that the Janesville Gazette IS the story in Janesville and outside of this blog, you rarely read stories about them. With the Gazette, the story is always about you ...and what's YOUR story? The newspaper also tells a variety of stories about Janesville and certain groups, but only through carefully adjusted and filtered lenses that for the most part are designed to prompt action or change public opinion or solidify the status quo. Of course it's important to realize they probably couldn't tell the whole truth about themselves either without it being constructed as propaganda or a commercial ad. So over the years I've tried to tell their story, for all it's worth. For starters, the Gazette generally does not like citizen activism. Particularly citizen activism that is independent from the establishment system. They view those folks as malcontents, rabble-rousers, rogues or just simply delusional. Much like they view me. Heh, heh ...heh. I generally keep my opposition quiet about citizen activism in Janesville mainly because true independent citizen activism (without grants or big $$$ backers) is, in this day and age of civic disconnect, disgruntlement and dysfunction, something to behold and defend regardless of the issue. That doesn't mean I support every local activist's cause. But what I do respect and value is their direct participation and their passion, even if I vehemently disagree with their position or their tactics. That includes genuine tea party activism, providing it's not the big $$$ astro-turf variety that has co-opted the movement. Some of my friends might disagree with me, but I think genuine ...and I mean genuine, tea party advocates deserve a chair at the table. That's one of the reasons why I don't mix it up or get in the way of local folks like Briarmoon, Bill McCoy or others who are doing it their way to instill change, for good or bad. Unless I became a target of an attack, then I would certainly not hesitate to defend myself. But that's not the case at all. I do confess however, outside of her relentless city hall activism which I respect, and the fact that I agree with her about reconstituting alderman wards and mayoral leadership AND opening local government, there is very little common ground on other issues between us. That includes her unorthodox style and peculiar way of reaching out, and besides, who am I to judge? Personal attacks are also something I avoid in my blogging. But what I believe is most important is that a citizen's activism, no matter how small the cause or zany it may appear to some folks, should be allowed to rise or fall by its own volition - and not have a local heavyweight force such as the Janesville Gazette take control of the message to deliberately steer it into the ground. That is precisely what the Gazette attempted to do in their latest article and most recent editorial on Briarmoon. It's one thing to inform the public and offer an opinion. It's an entirely different thing to take up arms (ink) not only to destabilize a campaign, but in direct opposition to the activism. You become worse than the activist you're wrongly trying to stop. But that's nothing new from the Gazette. Because after trashing Briarmoon in their editorial "history lesson" for Janesville newbies, the Gazette tells Briarmoon's supporters that rather than supporting her efforts, why not support candidates for office who have the same objections ...or run for office yourself? But if you did that and won a seat on the council, this is what you should expect from the newspaper if you raise that objection. But gee whiz. When it comes to politics or citizen activism then, why organize at all - ever? Why does Forward Janesville exist? Rock county 5.0? The UAW? Or neighborhood and block watch groups? The list can go on and on. Of course there's a lot more wrong with the Gazette than this particular cheap-shot editorial against a citizen activist. Just consider some of the newspaper's own history beginning with what they did to former Rock County Coroner Jenifer Keach. ⚥ You might recall it was a campaign of truly pathetic attacks that included sharply pointed criticism from county board members and bizarre stories from the newspaper's "we the people" blogger attacking the coroner because she dared to challenge signatures on her opponent's candidacy petition - an opponent who can best be described as a fake candidate. ⚥ This newspaper nearly destroyed Keach with the publishing of personal destruction and hate over petty if not unfounded allegations of political campaign violations. While today they completely ignore far worse allegations including documented proof detailing Scott Walker's full-fledged political campaign "war room" on the taxpayers dime when he was MKE county executive, and installing secret routers to circumvent open records laws. ⚥ This newspaper and their minions went on a vein-popping rampage, even suggesting Wisconsin's open primary system should be completely dismantled, honest to God ... after their endorsed fake candidate for coroner lost in the primary election to the incumbent Keach. ⚥ And, how the Gazette's editors went into the gutter to smear Keach's father by denigrating his honorable military service because his only fault was to defend his daughter from the newspaper's onslaught of cheap shots. ⚥ How they kept Janesville taxpayers in the dark on school enrollment figures and other issues that could have effected voter's perception of the $70.8 million school expansion referendum. ⚥ This newspaper targeted two candidates for Janesville city council simply because they had support from a local labor union. So much for encouraging citizens to participate in local government. ⚥ This newspaper censored local letter writers statements with politifact editorials, yet willingly publishes completely false and malicious statements anonymously in their Sound Off columns. ⚥ This newspaper and their supporting cast of political operatives went nuclear in their attack on the democratic party for daring to question Joe Knilans' and keep him accountable to statements he made about his residency during his campaign. ⚥ And, how they "correct" letter writer's criticism and view points on Rep. Paul Ryan with propaganda statements taken directly from his congressional Webpage. ⚥ Or, how they attacked an area videographer simply because he had the gumption to produce a documentary that by chance exposed the duplicity of local economic development groups and area legislators. The Gazette claimed he owed them the favor of burying the information because they granted him access. ⚥ How they rejected Sen. Russ Feingold because they claimed he lacked visibility when General Motors was rolling out of Janesville - but endorse homeboy Paul Ryan who not only is the district's in-absentia congressman, but whose positions and votes have indirectly dealt the final blows to the once robust automotive manufacturing sector of our district. ⚥ How the Gazette went ballistic when they thought the Janesville school board was operating in secrecy, but make no mention today of Gov. Scott Walker's refusal to answer a mountain of questions, the nameless donors paying his legal defense bills, his hidden travel (past) records, or covering up transactions and names of businesses collecting taxpayer awards through his WEDC agency. But just try to redact a citizens' name from a parking ticket and the newspaper will go all bazooka on you. ⚥ How the Gazette issues heavy-handed editorials and articles against skate boarders seeking a location in Palmer Park or against a small pocket of home owners trying to keep an alcohol-serving business with an outdoor sport's activity out of their neighborhood. ⚥ How they in the past, sold out their opinion page to Hobby Lobby full page ads. ⚥ This newspaper attempted to divide and conquer residents and isolate a Janesville city council member when he suggested it might be in the city's best interests changing to an alderman form of government. 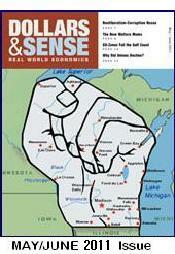 The paper responded by insulting the intelligence of those who felt underserved by the city's at-large system of council government and attempted to fuel deeper community animosity by stating current and past city leaders should be offended by anyone who suggests they don't care about all of Janesville's neighborhoods. ⚥ Or, when they employed a right-wing radio clown who repeatedly referred to users of Janesville's bike paths as communists when he was being polite. ⚥ And, how they fail to take their own advice they so authoritatively dish out to others. I would think that media observers and concerned locals who have been following this page know that I'm barely scratching the surface here on the Janesville Gazette. This blog, just so you know, has a fairly extensive record of their shenanigans dating back to 2006, so feel free to use the search box in the upper left-hand corner. There's a ton of stuff here. But don't get me wrong, folks. The people running the Janesville Gazette have the right to do as they darn well please - afterall it's their product and they own it. They're also fully entitled to take any position or offer any opinion, just like everyone else. I'd be among the first to defend their right to do so. But keep this in mind if you're new to Janesville. The Gazette's opinions are really not opinions, it's a campaign. RNR - After 160 Years Of Republican Publishing, Isn't It Time For a Change? Rock County Progressives Annual Picnic! Brats (natural ; veggie) ; Natural sodas provided !! State Assembly Rep. for Edgerton, Whitewater, Milton, etc..
plus Bruce Noble of the Grassroots Pipeline Awareness Group with an update on the Enbridge Pipeline 61 expansion through Rock & nearby counties. As you probably know by now, the Blackhawk technical college referendum asking local taxpayers for an additional $4 million annually failed with a 60/40 margin. Some people tend to think that its failure came about from the fear knowing that without a sunset clause, the tax hike could remain into perpetuity. No doubt that weighed heavily on voters. But I contend that more well-informed voters understand both the media and political dynamics that are at play. Clearly, with GOP single-party rule controlling every facet of Wisconsin government, there is no point for locals to resist the decline in schools, roads, infrastructure or the general quality of life, because for every dollar we might be willing to dedicate to our little neck of the woods - they can extract to replenish for funding the expansion of their tax cut strangle-hold. Any local effort to restore the revenue, feeds their circular continuum of capital extraction to balance their budget without raising taxes. Resistance is futile until we can restore at least one viable opposing political force to their agenda in state government. Regardless of any local funding attempts, local taxpayers and voters are expected to lose all control of their technical colleges as the central state powers continue to move "forward" with their right-wing agenda. The tech colleges will fall under full corporate control for employee training, but paid for with public taxpayer dollars. Local road funding is up next to face the same divide and conquer dynamics with public utilities, buildings and property expected to follow. ✦ Contrary to earlier reports, Scott Walker's statements claiming he cooperated fully with investigators ring hollow. New internal memos show Walker’s then chief-of staff was hostile to their motives from the beginning. When will Walker's lies and deception finally come to an end? ✦ Although Walker claimed to have requested the investigation, his office staffers were suspicious of investigators motives for taking the John Doe secrecy route. A secrecy Scott Walker seemed to relish in from the beginning, as he used it often as an excuse to avoid answering questions from the media and keep hidden his executive role in the criminal scheme. ✦ So it turns out prosecutors were targeted by conservatives and GOP partisans from the very beginning and not something that grew out of feeling wrongly accused. That's what the guilty do. ✦ New documents show Scott Walker was operating a political campaign "war room" from taxpayer paid county office. Fool us twice, shame on us. ✦ So typical. How self-serving business groups like Forward Janesville have claimed higher taxes, wages and benefits are a burden on local economic development and then lobby for tax breaks for themselves. But here they are endorsing a local tax hike on everyone else to pay for employee training at a technical college. The keyword: self-serving. ✦ I think members of the business chambers in Beloit including Forward Janesville are completely dishonest for supporting Scott Walker's budget cuts on schools/technical colleges. Cutting revenue that came from a much larger tax base but now spin around promoting local tax hikes to restore those funding cuts. They'll use the same strategy to promote raising local taxes for Janesville streets. Lots of people blind to the politics, fall for it every time. ✦ Never underestimate the power of Forward Janesville, Rock County five-o or their Janesville Gazette media flacks. They're a big "connected" club with a political agenda and operatives in every part of local government. ✦ Which candidates for the senate seat does Forward Janesville endorse? What's that? ...they don't endorse candidates? Yet candidates for public office endorse Forward Janesville or support their political agenda? Particularly democratic candidates whose base are under constant attack by the group. That doesn't make sense to informed voters. You can't have it both ways. Forward Janesville isn't running for office. There's no excuse for dems to support FJ unless they're completely detached from reality. ✦ The poor, disabled, seniors, women, minorities, the working poor, middle-class taxpayers and all wage earners should avoid any politicians like the plague that support FJ's legislative agenda. If that means avoiding most of them - so be it. ✦ I'm old enough to remember what republicans used to be like, and I swear all three democrats running in the senate primary are moderate republicans. Not that that's necessarily a bad thing considering today's off-the-rails GOP, but they're all slaves to the establishment system. ✦ Progressives and #NextGenDems, you're left with no choice but to vote for one of the three democrats running in the 15th senate district democratic primary. Just remember to hold your nose. ✦ I attended one 15th district senate candidate forum and listened in on another. When they both came to a close, I asked myself, "when will the Democratic Party hold a forum?" ✦ They're kidding me ...right? The three Dems vying for Cullen's senate seat argue against each other's record or lack of record, then each one explains how willing and better they are suited to reach across the aisle and work with the republican majority - a gerrymandered majority that doesn't need them or their vote to pass legislation. Still shaking my head. ✦ Did anyone else notice Janesville's road tax hike referendum never made it to the August ballot? Guess they didn't want to compete for the cobwebs in my empty wallet with the BTC referendum. So thoughtful. Only one tax hike per ballot at a time, folks. ✦ If it's approved, Gov. Scott Walker says "thanks" in advance. ✦ So all four wannabes for our state senate district must believe we have a skills gap to support raising taxes by $4 million annually without a sunset clause on home owners for Blackhawk tech college. That, while the area elite lobbied for, and won large income tax cuts, tax credits and forgivable loans for themselves. No referendum required. ✦ I wouldn't expect the lone republican senate candidate to stand up for wage-earning taxpayers, but I find it very disappointing not one democrat was willing to draw a contrast from the others to articulate why passing local tax hikes through referendum is not only the mark of politicians too coward to take a stand or too lazy to do their jobs, but a divide and conquer strategy to reinforce regressive tax shifts that continue the march toward greater wealth disparity. They all lockstep support for the BTC referendum. Voters shouldn't complain about economic justice if they don't get it. ✦ A dear friend, a proud self-described righty-libertarian, told me that everything we do from free will is our God-given right ...until government takes that right away - usually by force. He said those rights include those created by approving a charter for union representation, collective bargaining or taxation. He said that is how the Constitution was approved by our forebears and nobody alive today signed or voted on the Constitution. Yet we all support and abide by its principles because it is a form of contractual law. He also said restrictions on rights are sometimes justified by a common code of morality, but never justified by way of oppression or discrimination. His understanding of this was a welcoming surprise and we both found tangents of libertarianism to agree on, only distinguished by his righty, my contemporary lefty, and that we both oppose authoritarians. But that doesn't mean we don't have major differences. ✦ Conservatives have had single party rule in Wisconsin going on four years, and not only is the budget a mess, but look around. People don't trust one another, hatred for others with different views is on the rise and local governing bodies are acting just as arrogant as the single-party state authority in Madison. Roads and infrastructure are crumbling because state-sponsored funding to the top never trickles down and is a pathetic failure every time it’s tried. ✦ Walker's two budgets did not contain overall cuts to lower state spending. Fact is, each budget actually increased state spending from the previous. The money for increased spending however did not come from Walker inspired growth, but a combination of borrowing, withholding of state aid from communities and national recovery efforts. Walker's budgets confound the natural principle that increased spending fuels growth, because his are also about selectively taking more from working class pockets that spend, to fund tax breaks and credits for those who never have enough - his donor base. More spending by the state, but only to those who can afford to hoard capital - not recirculate it for the benefit of the whole. It's classwar trickle-up austerity. ✦ Amazing paradox. Scott Walker said his campaign will be expanding on social media and posting only the facts. But all I’ve seen are trolls twisting Wisconsin stats resulting from Bush’s national economic disaster into Doyle/Burke “facts,” while riding the coat-tails of Obama's national economic recovery and giving that credit to Walker’s "reforms." ✦ So we have Tea Party Governor Scott Walker, who promised to create 250,000 jobs and not spend more than we have. Yet, Walker borrowed billions to spend and we will be lucky if the state reaches half of those jobs, while many states grew faster. If that isn't enough, communities across Wisconsin are holding tax hike referendums to restore lost funding that he withheld and distributed to his campaign donors. So the question is how many times Charlie Brown are you going to trust Lucy to hold that football. According to this article by Mediatrackers of Wisconsin, there were an alarming 75 structurally deficient National Highway System bridges in Wisconsin in 2012, with only four of them being replaced, according to the Federal Highway Administration. The article pegs the estimated cost to replace all of the aging bridges at $218 million. But who is responsible for this? While the Wisconsin DOT has frontline responsibility for roads and highway infrastructure, federal transportation policy dictates how state transportation officials spend federal highway aid. Right now, the federal highway trust fund is facing a serious cash shortfall. OK, so the federal government is broke. We get that. There's a $58 billion shortage in the federal transportation fund alone. However, the federal government does NOT dictate how state collections are spent. That spending is controlled by the state legislature with the consent of the governor. Surplus anyone? Yes, strangely absent from Mediatrackers storyline was any mention of the state's nearly one billion dollar budget surplus that Walker and state republicans repeatedly take credit for. Instead, Mediatrackers blames federal government spending "mandates" on bike lanes and pedestrian paths for the shortfall - this despite acknowledging that the state owns responsibility for the condition of its bridges. Why would state republicans suddenly improve our infrastructure, "if the federal government eased mandates," when they shirked that responsibility when they had a surplus? Without mandates, a governor could take federal money earmarked for troubled homeowners facing foreclosure and use it instead to balance the state budget ...and what governor would do such a horrible thing to their people? Without a mandate, a state legislature could accept federal money for bridge repair, but use it to fund tax cuts like they did when they had a state surplus. God forbid ...what legislature would put so many people at risk just for an election year talking point? Not ours ...nooooo. They are clowns. But let's hope this does not end in tragedy. For our sake. For most modern Democrats and Progressives, making a fiscally responsible effort to fund advanced educational public institutions is a tried and true staple for offering everyone a chance at the American dream. But I also totally understand local folks who might be unwilling to vote themselves a $4 million annual tax hike into perpetuity simply by request from administrators of Blackhawk technical college. Particularly if you're among those who are sick of the smoke and mirrors budgeting tricks state republicans and Gov. Walker have employed to divide and conquer constituencies. If you consider yourself an informed Rock County voter, the information distributed by BTC officials promoting the tax hike referendum has to be among the most confusing, game-playing pieces of political propaganda seen in a long time. Why I say political is because of the obvious effort made by everyone in this article, including the newspaper, to run cover for republican budget gimmicks and Walker approving state aid revenue in lieu of local property taxes earmarked for the technical college. This cynical ploy in turn means that tax payments going to the college to pay bills remain revenue neutral. This is a political agenda - not a budget agenda - as many would want us to believe. Truth is, some local folks thought they understood the budget damage Walker and company have deliberately burdened tech colleges with, and may have been sympathetic to a perpetual annual tax hike. But I'm not so sure anymore considering a top BTC official failed to critique Walker's political agenda by stating, "I want people to understand that the referendum is not about repairing damage, it's about offering opportunities." The school's effort to depoliticize their tax hike campaign is commendable on the surface, but it loses all credibility since the reason for the referendum in the first place is to overcome budget restraints imposed by the state legislature. This IS a political situation. Indeed. Also, left out of the Gazette article and paper was an opposing viewpoint to the referendum or any discussion about a special state committee meeting to change, perhaps radically, control and funding of Wisconsin's tech colleges. This is more than just a hypothetical situation here, folks. These committee meetings are being held with an interest in mind, not simply a review, intending to take control away from local boards and reassign property taxes. The Special Committee is directed to review the current governance model of the Wisconsin Technical College System (WTCS) in the interest of transferring governance responsibilities of local district boards to the state WTCS Board and examine the current funding model for the WTCS with a preference toward reassigning current local property tax revenue to a broader state tax source. We know that the radical right-wing interests calling the shots in Wisconsin, where every branch of government is under single-party rule, will end up accomplishing their preferences. Also, we have no idea or guarantee how an annual local tax hike would be handled under a different system. Republicans tend to think wage earning taxpayers never have enough "skin in the game." That backward mentality could be a clue. Even if the special committee doesn't make a decision anytime soon, BTC officials insisted that the referendum is NOT about repairing damage. That's an eye opener. In other words, the sky will not fall. BTC will be there when you awaken the next morning. So will access and opportunity. Earlier, I recommended voting "no" on the BTC tax hike referendum, citing political reasons. Now, I'm more certain than ever, given the additional information that voting "no" is the smart thing to do - for now. One forecast shows that even if Walker does nothing the state will add 190,000 jobs over the next four years. Another forecast shows there will be nearly 290,000 new jobs. Don't bother clicking the link. It's long cold. During the gubernatorial campaign, Scott Walker vowed to create 250,000 jobs during his first term. He might pull it off, considering the steps he’s already taking and the fact that the state’s work force keeps growing about 1 percent annually. At that rate, the state would add more than 100,000 jobs in four years even if Walker did nothing. So let's look at the numbers. Up to and including the month of June, one fact checker put Walker's jobs total at 100,313 or about 40 percent of the total promised. With six months to go, it's very unlikely Walker will reach 250,000. In fact, Wisconsin has almost no chance to reach even the lower 190,000 projected estimate given four years ago. So what happened? Well, we all know Scott Walker's "reforms" happened. Yet according to the RGA Stand with Scott Wisconsin PAC, Walker's reforms helped put more Wisconsin residents back to work and in a recent survey, 94% of Wisconsin business leaders say the state is moving in the right direction. Before Walker took office, 90% said the state was headed in the wrong direction. That's quite a flip. Let me see if I have this straight. Back in 2010, economic forecasters expected Wisconsin to create on average, 240,000 jobs over the next four years, while CEO's from that same period said Wisconsin was on the wrong track? We now know Walker's wrong-headed reforms had a tremendous adverse effect on the state's jobs picture - in real time, failure is imminent. It's really not a projection anymore. But what explains the obvious inversion between the jobs projection and the CEO's outlook and why do they (CEOs) have such a a high regard for Walker's reforms? Not only that, as Plexus shed 116 workers, CEO Dean Foate saw his compensation go from $2.1 million in 2009, to $4.1 million in 2013. Did your pay almost double doing the same job over the past four years? That just about aces it.